This huge wheel was supposed to be temporary, but instead has become a permanently popular attraction. It’s not cheap, but it is a great way to see London from a different angle. The pods rotate slowly all the way round and it takes about 30 minutes to complete your journey from start to finish. Look out for all the major sights of London as most are visible from the eye. You even get a good view of Downing Street, so look out for the Prime Minister! The queues for the eye are not as long now as they once were, but at peak times you can still expect to wait in line for a while unless you buy London Eye “Skip The Line” Tickets. Even if you’re not planning to ride on the London Eye, it’s still worth heading for the river bank where it is located just to stand below it and look up. By doing this, you get a real sense of its size and how the whole thing was constructed. It’s almost hypnotic to try and watch the pods moving from this angle too. The river bank here is wide and pleasant to walk along and the small park area is often busy on a warm day with tourists and Londoners catching some sun or having a picnic. 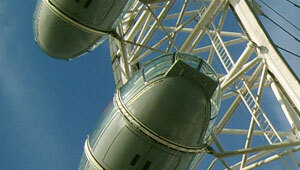 The London Eye is open daily from 10am. Closing times vary according to the day and the time of year, from 8pm on a winter’s day to 9.30pm in the summer. A standard adult “flight” costs just over £17 (2012 price) with discounts for children, seniors, disabled visitors and families. If you don’t want to waste time waiting, you can check out the latest prices for “Skip The Line” tickets here. Other “flight” options include the Champagne Flight and Private Capsules . We once booked a Champagne Flight and as we were the only ones booked at that time, we had a pod to ourselves and a full bottle to drink! The London Eye is situated right at the front of the County Hall building and the nearest tube stops are Westminster, Embankment or Waterloo. The London Eye is situated in Jubilee Gardens, next to County Hall overhanging the river Thames, on the opposite side to the Houses of Parliament.